Most of the international artists have landed in Calcutta, some are still arriving from London, Paris, Vienna, Taipei, Buffalo (USA), Malmo (Sweden)and Delhi. Already this is music to my ears: an international encounter taking place in Calcutta to create a new platform for Indian and international dance artists, choreographers, musicians, performers, teachers, students, researchers and dance enthusiasts. Names of the participants start spinning in my head, evoking points on all sides of the globe: Arun, Rocío, Martyna, Saurabh, I-Fen, Sydney, Urmimala, Elin, Yu-Chieh, Emelie, Suman, Chieh-hua, Dam, Meghna, Vanessa, Yu-Wen, Prasanna, Zach, Mitul, Amanda, Tomas, Vikram, Janet, Ieva, Sohini…These are more than 20 participants who over the next 5 days will perform, create, deliver talks and run workshops in Calcutta for the community and local artists. This first day is all about getting to know each other. For the international artists it’s also time to orientate themselves around Calcutta and to get used to the special beat of the city. In the evening, all gather for a meal at one of the participants’ house, all excited to be sharing this unique experience. The workshops are on in full swing around the city-at The Calcutta School of Music, Sparsh Studio and Rhythmosaic. Workshops are a fantastic opportunity to connect with the community and local artists. 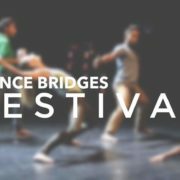 Open to everyone, the workshops at Dance Bridges brushed over a broad range of dances and styles from around the world- Manipuri, Kathak, Contemporary, African, jazz- opening a conversation between cultures to share knowledge and new ideas. It is heart-warming to meet this crowd of curious participants. Today is also the first main performance night at Kala Mandir and the audiences are enthralled by dance works from the UK, Taiwan, India, France and the USA. Putting on a show of this scale requires great team work between dance artists, technicians, sound engineers, lighting designer and volunteers. In the morning, audience, artists and academics gather at Goethe Institut Max Mueller Bhavan to listen to presentations on current issues within the creative field and also address audience’s questions about yesterday’s shows. It is fascinating to hear them all. I realise how varied and vast the dance world is; at the same time how close the dance community around the world is in terms of values. The speakers share with us their belief in the power of art and dance to change lives and communicate on a deeper level. 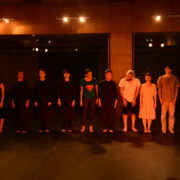 The second night of performance at Kala Mandir featured works from India, Austria, the UK and the US and a range of contemporary dance works reflecting modern society and current issues. It is astonishing to see how much each artist reveals of his own culture through his/her performance. The last piece of the programme “Resonance” is the result of a three week residency during which UK dance artist Dam Van Huynh created a work on a group of local artists. Taking a break from the stage the festival artists are up for a different kind of footwork. Some of the international participants accompanied by local artists and volunteers hit the streets for some sightseeing, exploring Victoria Memorial and the New Market and taking a boat ride on the Hooghly. These are moments when local and international artists get to create strong friendships. It is the last day of the festival and there is an air of nostalgia. Audience, artists and academics gather again at the Goethe Institut for the last conference. The speakers draw attention to the fact that dance is still undervalued and that alot needs to be done to promote it. They also emphasize the importance of research and need to have an open-mind, to accept all dance styles and learn from each other. Dance Bridges has built a special relationship with Swedish based Screen Dance Festival to curate a programme of dance films over two days in collaboration with Goethe Institut and Delhi-based Gati Dance Forum. In the afternoon some of these are screened as part of Dance Film Screenings at Goethe-Institut. Running and international dance festival like Dance Bridges is like running a marathon, you need endurance. And for that I want to thank Vanessa Mirza the festival director of Dance Bridges Festival.